H&R Block Deluxe + State | $25 | Amazon | Prime members only. Discount shown at checkout. H&R Block Premium | $27 | Amazon | Prime members only. Discount shown at checkout. 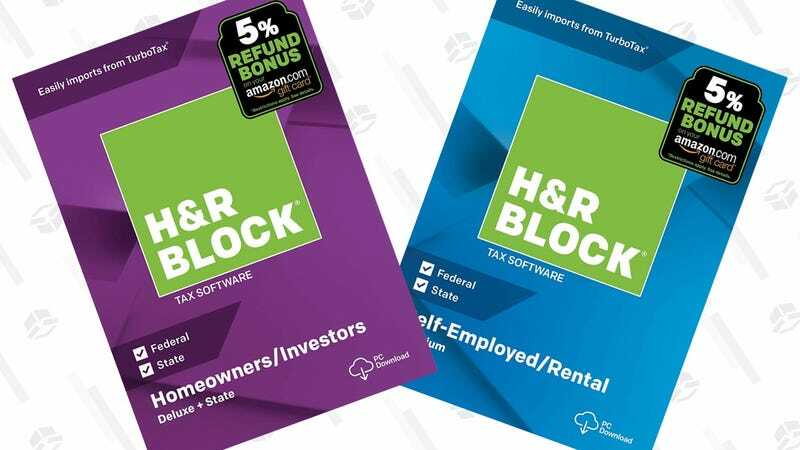 Tax season is upon us, and if H&R Block’s Deluxe + State software is right for you (you can use this tool to find out), Amazon’s currently discounting it to just $25 for Prime members, after a 15% discount at checkout. That’s a few bucks more than the best price we’ve seen on Amazon, but it’s way less than the $45 H&R Block charges on its own site. Deluxe is great for homeowners and anyone with any sort of standard investment income, but you’ll want to step up to Premium if you rent out property or are self-employed. It’s also on sale for $27 for Prime members, which is an all-time low.